Star Trek: Discovery Series Premiere Recap: Get Back in the Antiproton Chamber! The premiere episode of Star Trek: Discovery opens with a shot of a galaxy slowly turning into an iris, which is a sci-fi trope I have loved ever since I first saw it during Men in Black. I loved it just as much tonight as if I had never seen it before. This is quickly followed by a bit of banter (“You’re lost,” ”Technically, we are lost”) that further relaxed me into a state of pure lizard-brain enjoyment. Said banter is exchanged between a calm and confident captain — Captain Philippa Georgiou of the U.S.S. 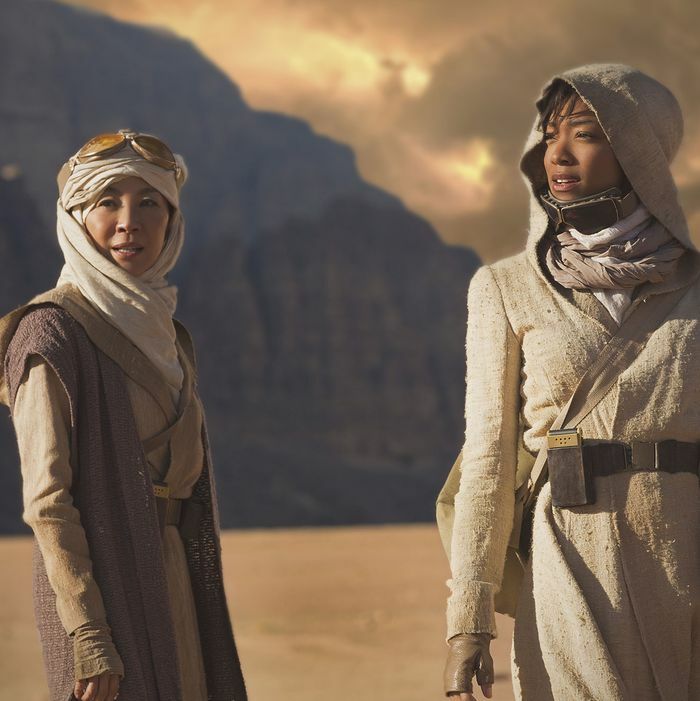 Shenzhou — and her skeptical, measured first officer — Michael Burnham, (also called Number One, in a nice nod to Majel Barrett’s short-lived role in The Cage) — as they explore the surface of a desert planet belonging to a race known only as the Crepusculans (“He’s crepuscular! Get him, boys!”), a name that immediately and eternally endeared them to me. In the grand tradition of Starfleet’s Prime Directive (“Kind of do whatever you want as long as nobody sees you do it!”), Georgiou and Burnham attempt to, essentially, bomb a local well into decontaminating the surrounding water table (“Sure!” –Me). Every Star Trek incarnation has to decide its own relationship to the Federation’s status as an ostensibly demilitarized body, and to what degree Starfleet can be understood as either a peaceful, scientific endeavor or as essentially an interstellar navy. There are endless possibilities, and from the outset Discovery seems honestly committed to exploring a number of them — some in good faith, others less so. This conflict is nowhere more strongly lampshaded than in Lieutenant Commander Michael Burnham herself, a human raised on Vulcan according to Vulcan tradition, and the ward of no less than Sarek, Spock’s father. I profoundly appreciated the fact that she seemed to have acquired the innate sense of Vulcan Time Estimation through her education, because it supports my long-standing and totally unsupported belief that I, too, could be punctual and disciplined instead of always texting “I’m five minutes away,” as I get into my car, had I been raised by Vulcans. I want very much to avoid coming across as the superfan from The Simpsons who attended an Itchy & Scratchy Q&A panel and asked the question, “In Episode 2F09, when Itchy plays Scratchy’s skeleton like a xylophone, he strikes the same rib in succession, yet he produces two clearly different tones. I mean, what are we to believe, that this is a magic xylophone, or something? Boy, I really hope somebody got fired for that blunder,” but I found myself genuinely surprised when, at the episode’s climax, Burnham performs a Vulcan nerve pinch on her commanding officer, a move that I had previously believed non-Vulcans to be incapable of delivering. (Data, Odo, and a melded-with-Sarek Picard all standing out as notable nonhuman and enhanced-human examples.) Upon rereading this paragraph, I can confidently say I have failed in my initial objective, but I confess I find myself wildly curious about Burnham’s upbringing. I want to know everything: Was she expected to complete the kahs-wan at age 11, like everybody else? Did they let her bring some, I don’t know, whatever the Vulcan equivalent is of Gatorade (“A tri-ox compound?” —Me), on account of how humans are pretty easily dehydrated in comparison with Vulcans? Vulcan teachings are often intricately bound up in Vulcan physiology — the various meditation levels that require telepathy and so on — and I have so many questions about what a biological human’s experience of the way of Surak might look like, not to mention the obvious comparisons to her apparent foster-brother Spock and his own struggles growing up as the child of both Vulcan and human parents on the same planet. • When the credits began. • Again during the credits when they showed, like, a blueprint for a communicator. • Every time I heard the good old communicator chirp. • During the Klingon funeral, specifically the part where all the surviving Klingons bellowed their rage to the skies and shunked Rejac’s coffin out of a porthole. • When Ensign Connor (henceforth “Earnest Space Baby”) does a cute, chipper little fake-pilot’s announcement for Burnham’s solo EVA-suited jaunt out to examine a damaged interstellar relay, and then again a minute later when I reconsidered it as an indirect tribute to Anton Yelchin’s similar chipperness. The primary conflict of this premiere is centered around an ambiguous encounter with a Klingon artifact, which appears to have damaged one of Starfleet’s interstellar relays. Whether the damage was intentional, whether the damage was intended to draw a Starfleet response, whether the Klingons are guaranteed to attack or simply open to the possibility — everything’s up for debate. Burnham reflexively defends herself against the lone Klingon manning said artefact, killing him, which leads to the hands-down best line of the entire episode: Burnham wakes up in a sick bay being treated for radiation sickness, learns she’s been unconscious for three hours, then immediately lets herself out of the decontamination chamber early (why is there even a button for a patient to unlock the doors of their own decontamination chamber?) to head for the bridge, causing the always-fantastic Maulik Pancholy to deliver the line, “I NEED YOU BACK IN THE ANTIPROTON CHAMBER,” with perfect sincerity and not the slightest hint of a wink. Meanwhile, back at the ranch, a cadre of Klingons mourns Rejac, their fallen “Torchbearer,” by encasing him in the most fabulous sarcophagus I have ever seen with my unworthy eyes. There’s something to be said for a really hefty set-dressing budget. (“Oh my God,” I wrote in my notes, “This room looks like the H.R. Giger Outer Space Vatican.”) Rejac’s brother, Or’Eq, respectfully declines the suggestion that he take up his brother’s post due to insufficient belief in the power of Kahless and also a real lack of team spirit. Voq, “son of nobody,” volunteers with an odd, indirect allusion to Ephesians 2:8, and proves his worthiness by briefly setting his hand on fire. Everyone else thinks this is fantastic. I am worried about his hand, and choose to believe there is a cut-for-time scene somewhere of a Klingon Nurse Chapel going over it with a medical tricorder for a few passes. The bulk of the episode is given over to flashbacks from Burnham’s Vulcan upbringing and the Klingon-led attack that killed her parents, which led, somehow, to her being raised by Sarek. She’s weighed down with a particularly traumatic past, as well as having her motives constantly questioned by her commanding officer, the Starfleet admiralty, and Sarek himself. Part of me wonders if, in an attempt to correct for the perception that previous Starfleet captains and XOs have “gotten away” with too many violations of the Prime Directive as well as cowboying it in general, Discovery is trying instead to put one of its protagonists under relentless external and internal scrutiny. Burnham attempts to make a case for attacking after the Klingons fail to respond to the Captain’s request they either open communication or exit Federation space, citing numerous case histories of Vulcan-Klingon encounters. After an unprovoked attack on a Vulcan vessel 240 years ago, the Vulcans made it official policy to fire upon any Klingon warbird they encountered until formal relations were established. “They said hello in a language Klingons respected,” she says. “Let’s give them a Vulcan hello.” Burnham suggests that the Shenzhou follow the same strategy, but Captain Georgiou insists that Starfleet doesn’t fire first (which is … sometimes true!). It’s a tense situation: Where’s the line between prudence and belligerence? When does a legitimate threat merit escalation? How do one’s preconceived notions about the behavior of a perceived but inactive enemy prevent one from seeing reality? But what happens next abandons a number of potentially more interesting long-term possibilities, and creates a high-stakes standoff at what feels like the expense of Burnham’s character. After being repeatedly dismissed by her captain, her colleagues, and her foster-father, being reminded again and again that her own personally traumatic history makes it impossible for her to see their present situation clearly, Burnham takes matters into her own hands, nerve-pinches Captain Georgiou, and commands the crew to fire on the Klingon ship, a move that felt out of place and an artificial attempt to very quickly ratchet up the stakes. The captain returns just before the credits to pull a phaser on her erstwhile first officer and remand her to the brig. It’s an awfully bold move — sort of like opening TOS with “The Menagerie,” rather than with “Where No Man Has Gone Before” — but I’m not sure that it works. We’re only one episode in, so there are of course ways this could eventually pay off that at present remain to be seen. Wherever we’re going, I’m just happy to be here. Star Trek Recap: Get Back in the Antiproton Chamber!